This Way to the Fireworks! This is another single layer card; yes, I'm still practicing my CAS style. I printed it and the sentiment directly onto the white CS which would become the card base, then colored it with my ProMarkers. I've had several people ask me how I know where to put the image when I'm looking at the "page" on the computer screen. I set my bottom margin at .50, then add the image and shift it down to the bottom. I move it over from the left side margin to where I think it will work, then print onto inexpensive printer paper to make sure it's lined up where I want it. I make any adjustments that might be needed, test print it again and, when all is perfect, I put the card stock into the printer and print for the final time. I trim the page to the width I want for the card by cutting off the right hand side, using my paper trimmer. I score and fold the card into a tent style. Just in case you want to know what happened when the ant lit the fuse, here's a shot of the inside of the card. I was looking through my images from Morgan Fitzsimons (now Morgan's ArtWorld instead of Fitztown) and found this one which I've never used before. I remember falling madly in love with it but then it just languished in the file. Today it got colored and now it graces a card which will probably end up being a birthday card. The image is colored with ProMarkers and the wings have sparkle gel ink added to them. Here's a close up so you can see the sparkle better. This is my very first attempt at coloring black hair. That will no doubt improve with more practice but I'm satisfied with it as a first effort. I don't know if the flowers were supposed to be orchids but they just called for pale orchid color so they became orchids no matter what they were originally. 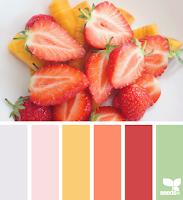 :-D Besides, that allowed me to use what is fast becoming a favorite color combo - yellow and lavender/purple. 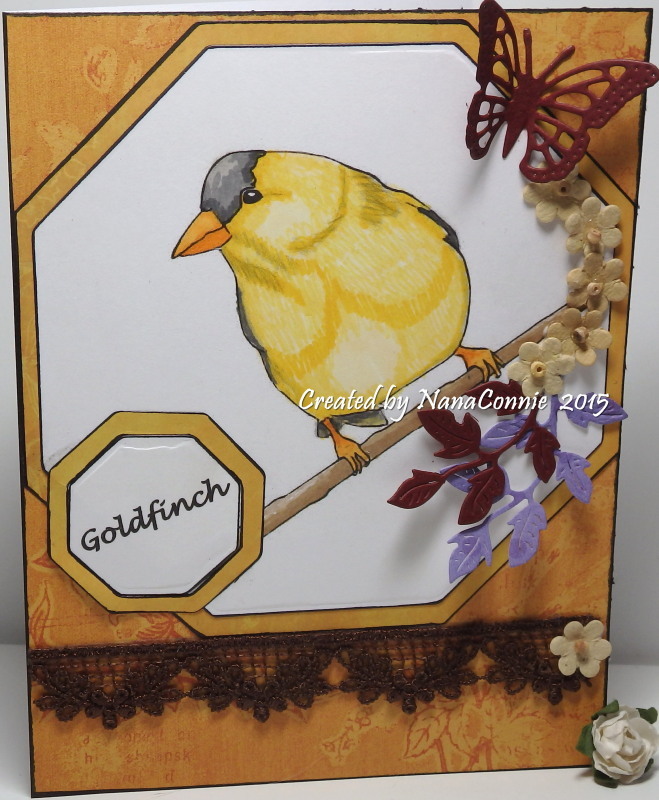 I wanted to keep this one CAS so the only embellishment is from the die cut butterflies (Cheery Lynn). Those were cut from scrap CS. 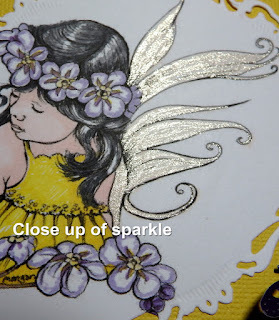 The image itself was cut with a framing die from Spellbinders. I've fallen madly in love with AuroraWings' darling little sprites and this Dandelion Sprite is no exception. Their challenge theme this time is "Sprite Delight" and you just have to use a hand-colored sprite on your project to enter. I chose my colors from the challenge at The Outlawz. and added the gold mesh for the lace. 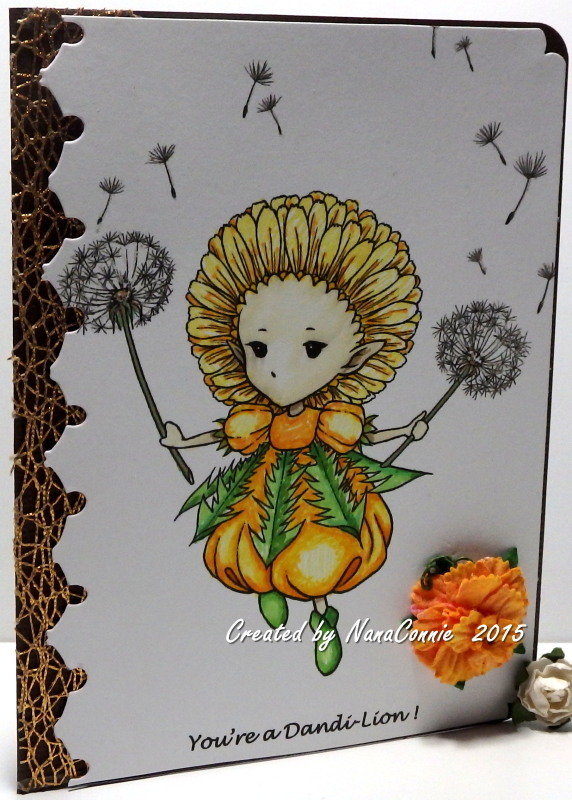 The image is colored with ProMarkers and I added glitter gel ink to the dandelion seeds but it just doesn't show in the photo. 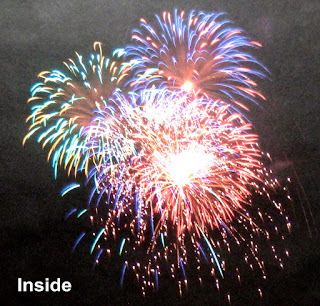 The sentiment was printed on the same piece as the image. The fancy edge was made with a Cheery Lynn border die and the flower is from Recollections, dyed with a marker. Everything is put onto a dark brown CS base. I don't think I've ever had more fun coloring an image! We have a new challenge at QKR Stampede starting today and our theme is "Cows." Yes, I said "Cows." I hope you'll check out all the different cows used by the gals on the DT. We all giggled over our images and cards this week. Both my sentiment (Digi 11207 - Cow Country) and my image (Digi 1004 - Long Horn) came from QKR Stampede. 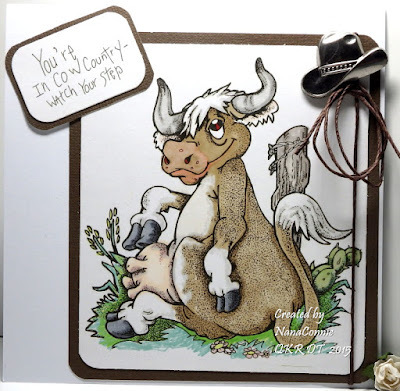 I'm happily dedicating this card to my friend and blogging buddy, Lynn (Creative Crafts by Lynn,) who lives in Cow Country somewhere out there in the middle of Texas. Some time back, she made a card and discovered that her hubby was very confused about the difference between a pig and a cow, which is a bit embarrassing for a Texas cowboy! She had me laughing for a week with her story about that one. I colored this image with ProMarkers then cut it out and punched the corners. I used dark brown CS to mat the image and punched those corners, too. I printed the sentiment, rounded the corners, matted it and rounded those corners. Everything was adhered to a square, white card base. I added the twine, used a bit more of it to make the lariat, and finally added the cowboy hat charm. There you go, another CAS, masculine card filled with fun and who knows what else. After all, as the sentiment says, "You're in cow country..."
There are all kinds of holidays throughout the year and many people talk of their "holidays" instead of their "vacation." 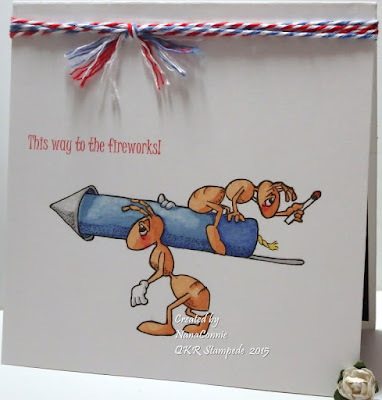 We card makers prepare for various holidays by making cards to celebrate the occasion. Calendars list all sorts of silly holidays like "National Take a Crab for a Walk Day" or "International Sneeze Day." Personally, I believe in keeping things more basic and simple and I've announced my philosophy on happiness and holidays in the sentiment on this CAS card. This is another of my single layer CAS cards with the sentiment printed directly onto the card front before stamping the House Mouse image. I stamped it using gray instead of black ink so that the outline was less distinct once it had been colored. I colored the image with ProMarkers and chalks. Both the green and pink ribbons came from my stash and were probably originally found at Joann Crafts or Michael's. I made the double bow by folding some lace and adding a small pink bow on top of that. The small bow I tied using my Craft-Dee BowZ bow maker. One simple gem was added to the bow. My dear friend, Teresa (of Tickell Expressions,) drew this beautiful Goldfinch and shared it as a freebie on her blog earlier this week. I found some time last night to get him colored and he just comes to life! Go get the digi and color him yourself. You'll see what I mean. 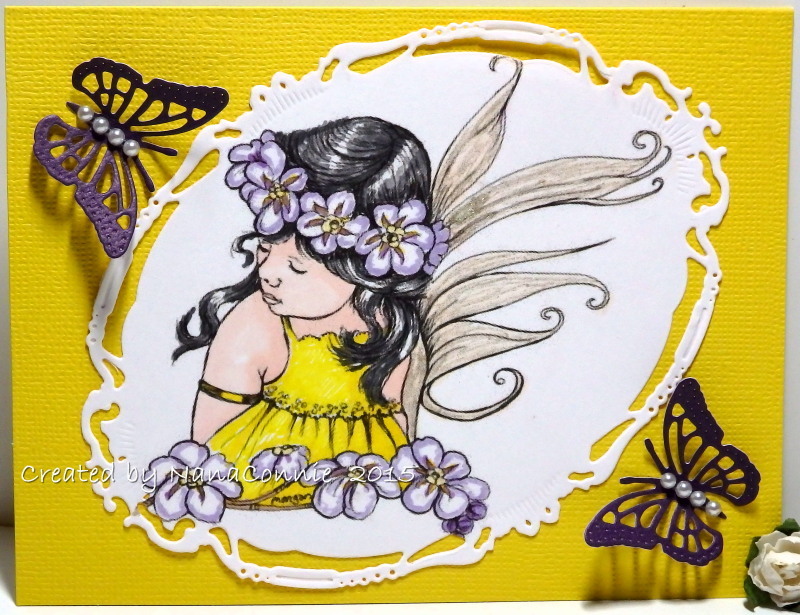 This was going to be totally CAS with just the colored (ProMarkers) & die cut (QuicKutz) image and sentiment on the front of the card but then the lace and the little punched flowers crept on, and the flowers needed some leaves (Cheery Lynn), and then the butterfly (Cheery Lynn) danced by and lit on the top corner... Well, you've heard of "If you give a mouse a cookie..." right? It was kind of like that. :-D Still, it does have a lot of open space so maybe it is somewhat clean, hmmm? 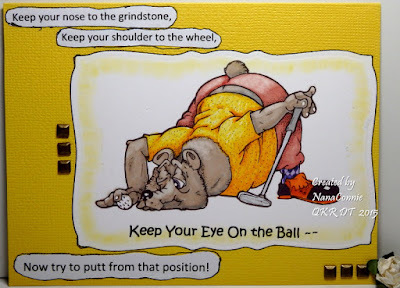 For those of you who don't play golf, I want you to know that it is hard work and takes a great deal of concentration. I don't play either, but I've been told by experts and I believe them. I do, I really do! 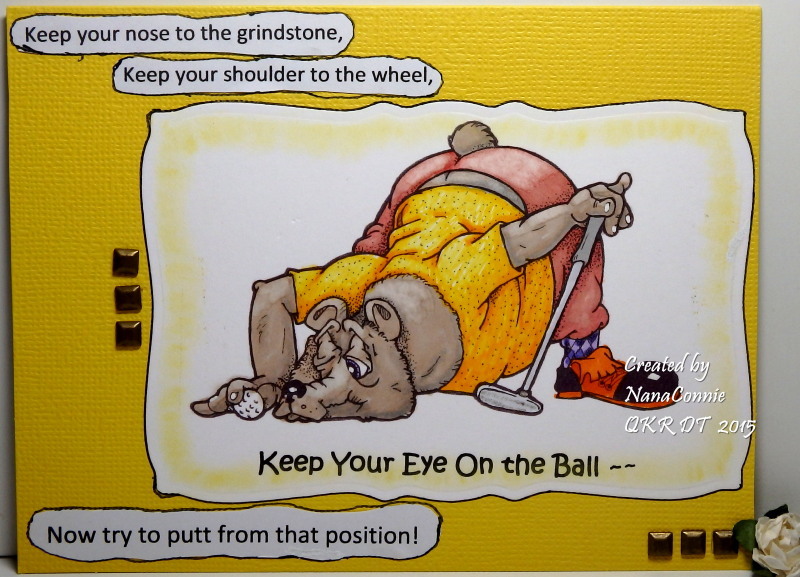 :-D For a quick primer on all the things a good golfer must do, see the sentiments listed on my QKR Stampede DT card below. Our latest weekly challenge starts today and our new theme is "Golfing." I used Digi 15309, "Golfing Bear." 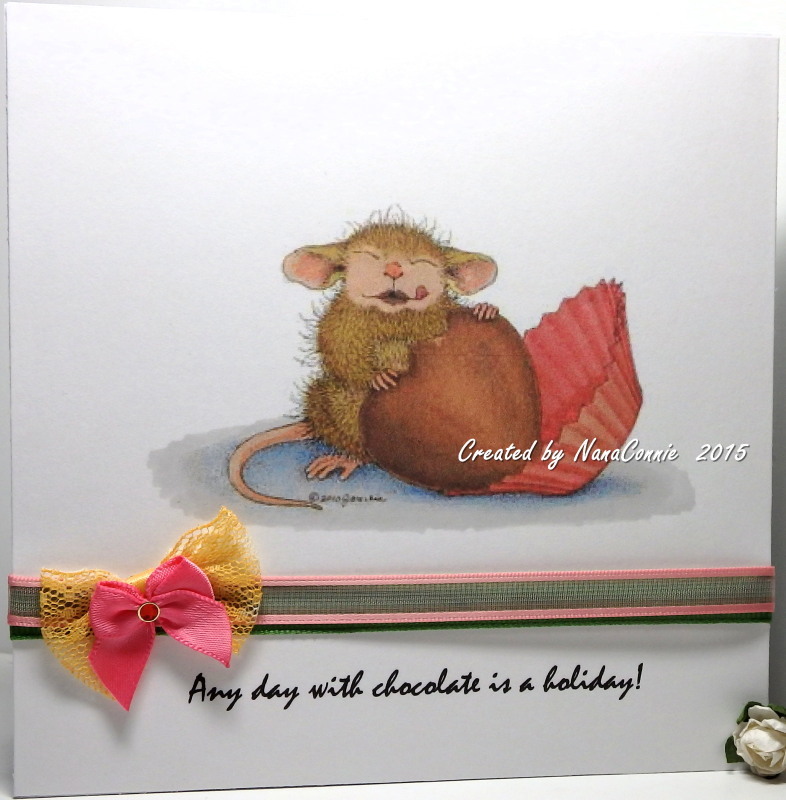 The image is hand-colored using ProMarkers, and then cut with a die from Spellbinders. I chalked the edges before I removed it from the die. The sentiments are all printed using a computer font, then hand cut and added to the card front. I added some doodling around the sentiments to make them stand out a little bit from the background. The square metallic brads are the only embellishments because I really wanted that image to be the primary focus. When I found this "Western Boots" image at Pattie's Creations, I knew I needed to use it for a Father's Day card. 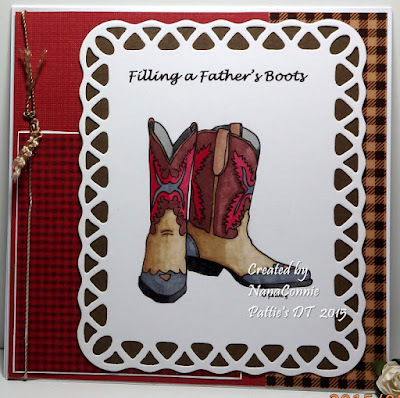 Since the theme for our new June challenge at Pattie's is "Father's Day or Graduation," I knew it would work perfectly for my DT card this month. The image and the sentiment were printed at the same time. I used my ProMarkers to color the boots and then I cut the image with a die from Spellbinders. I added a brown CS backing and hand cut it to the outside shape of the die. I found those pieces of gingham check dp in the scrap basket and rescued them just for this card. I layered those onto some red CS which I first ran through my 'Linen' embossing folder. The twine was the final touch and I frayed the ends to make it more distressed looking. All of that went onto the card front and everything was from my stash. You have all the rest of the month to play along with us so get going on those Father's Day or Graduation cards, then get your entry posted on the challenge blog. See you there. Happy Stamping. NanaConnie.